What a close game this championship was! 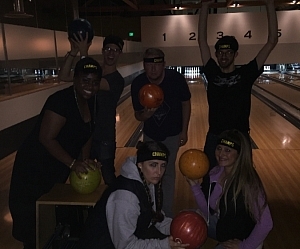 It was neck and neck in the final game, with Babes and Balls losing up until the 10th frame. Then, lightning struck. One bowler, with only a strike to her name all game, bowled a turkey with her last three rolls! Similar events from other members of the team led to a comeback that made Babes and Balls winners by 6 pins! Wow! Congratulations to both teams for such an epic game. Dressed in WWE garb along with the rest of her team, Jessica put on a dominating performance on the evening. Frame after frame, she outpaced her competition, proving to be a key cog in her team's victory. For being the MVP of the big game, Jessica is our player of the week. Congratulations! LOVE LOVE LOVED! Babes & Balls tonight. The Garage was pretty slow, so there's NO WAY you could have missed this team. There was a gravitational pull! Lane 11 was roaring all night long - amazing energy, such positivity, lots of smiles, a competitive but friendly attitude, and just so supportive. It's hard to believe that this team was just meeting each other for the first time 3 weeks ago!